Oscar turned four months old this week! Time is flying by, and it’s bittersweet that he’s growing so quickly. On one hand, we are seeing more and more of his personality as he gets older. On the other hand, I’m going to really miss our cuddle times when he is too big to fit in my lap! We are feeling more bonded with Oscar every day, and I never imagined I would love a pig this much! In the past month, Oscar learned to sit and seems to have his potty training down. We have figured out our routine enough that he squeals when he needs to go outside. Squealing isn’t my favorite sound, but I’ll take it when he’s trying to communicate with me instead of having an accident. Oscar also tried some new foods this past month. He ate his first grape (slippery! ), baby carrot, and strawberry (also slippery!). Other than that, he still eats his Mazuri Mini Pig Youth food and every piece of grass he can. When I can convince him to stop eating grass, he goes on short walks with me to get some exercise. 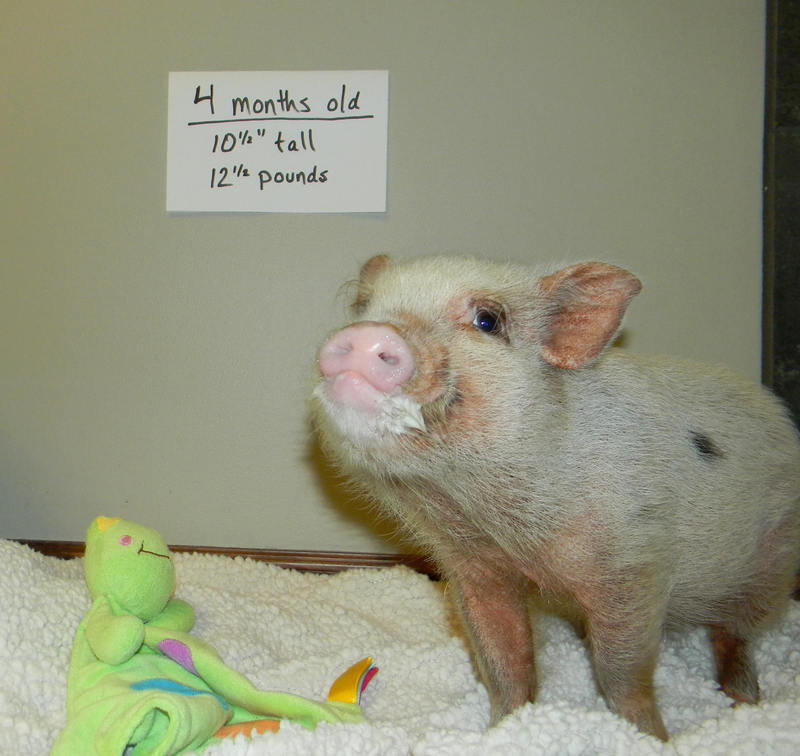 At four months old, Oscar came in at 10.5″ tall and 12.5 pounds. You can see his previous weigh in here. Hi!! I just found your YouTube channel, and I loved it! I have a ginger spotted mini pig, her name is Gigi and she’s 4 months and weights the same as Oscar in this pic! I actually found you looking for videos, how to teach her some tricks and I love your videos! Thank you for sharing! My Julianna pig is turning 4 months old this week and we are still having some issues with potty training. You have watched videos and read blogs. I read your page regularly. Do you have ideas for me? My Dotty Lin is a Juliana Piglet, four months on August 4th. She was easy pesy to potty train. Only took two days, she is leash trained, but whats been happening now is shes having more tantrums when I hold her. I don’t know how to stop them although I absolutely love her spunky personality. Today she weighed in at 11.4 lbs.. is she growing to fast? Am I over feeding?